We had mom and dad’s anniversary party today and all went well except for one big thing. Mom couldn’t attend the party because of her health. She has copd and caught a cold yesterday. She felt so bad she just couldn’t make it. My brother, sister and I talked it over and decided that since we had bought all the food and family and friends had traveled so far, we would go ahead with the party. Fortunately my dad was able to come and visit with everyone. Many relatives and friends did go visit my mom at her home to give her their best and say hi. I wanted to contiue and tell you more about how we did the party. 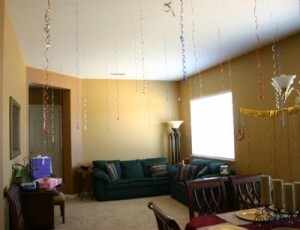 I took a picture of how we decorated with the ribbon but the picture doesn’t seem to do it justice. It really does look neat in person with the ribbon hanging from the ceiling. The more ribbon you put up the more the dramatic the affect. 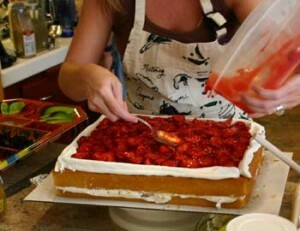 I mentioned the other day that Debbie was going to make the cake so I wanted to show you what she came up with. She was able to take a photograph of mom and dad and turn it into an edible (made of sugar) top. 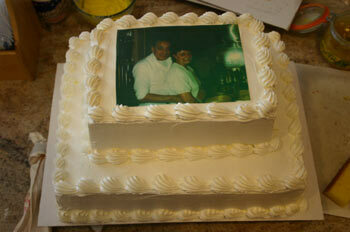 The bottom layer was white cake with strawberry filling for dad. The top layer was lemon cake with lemon filling for mom. The frosting was a whipped cream frosting. Debbie came up with the wording on the cake which fit in with the chili pepper theme. 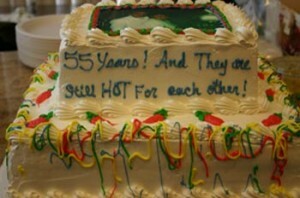 Don’t you love those chile peppers on the cake? Not only did it look great it was delicious. I will write again soon to talk about the food we served at the party.